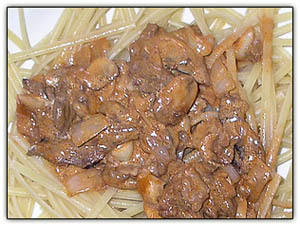 Beef Stroganoff is a favorite of both Baby's and Tuck's, although Tuck decided the pasta this evening was too al dente for his taste. That gave us a chance to clean up the plate after he and the Babe were through. Marinate sirloin tips for an hour or so in a mixture of A-1 Sauce, soy sauce and tomato juice. Just before cooking, slice on the bias into bite-sized pieces. Chop one large shallot and five large cloves of garlic, and slice eight mushrooms. Heat heavy-duty skillet on high, add one tbsp butter and 2 tbsp oil and sauté beef, stirring. Add freshly ground pepper and then toss in shallots, garlic and mushrooms and continue cooking over medium heat until done. Add marinade, cook about a minute and then finish off with a cup of sour cream. We can never get enough. Great as leftovers if there ever were leftovers. Yum! 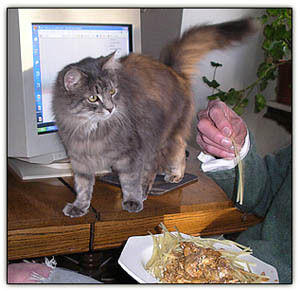 Both the kitty and the food are yum! It's been a rough week and I needed some comfort blogging! This post hit the spot! At last! A very rare (almost) non-tomato stroganoff recipe for those of us who are sensitive to the glutamates in tomatos. Can't wait to try it. Just as soon as I get my tastebuds back from this flu. Better already, if I'm reacting to a recipe! Pat: Here's a thought re tomato juice . . . You could substitute all kinds of things -- cider or other fruit or veggie juices come to mind. That stroganoff looks wonderful. I can't wait until monitors with scent receptors are invented. Mix the flour and paprika together in a pie plate. Dredge all the chicken pieces in the flour and put into a LARGE saute pan to which you have added enough olive oil to cover the bottom lightly. Brown 3-5 minutes on each side. Remove from pan and put aside. While the chicken is browning, cut up the onion and bell pepper and smash the garlic cloves. Once you've removed the chicken from the pan, dump in the peppers, onions and garlic. Sprinkle the curry powder over all. Cook the vegetables until they are starting to get a little limp, then add 1 cup chicken stock and the can of tomatoes and two handfuls of the yellow raisins. Turn down the heat, slap on a lid and simmer for 10 minutes. While this is simmering, put the rice on to cook following package directions. Add the chicken back into the vegetables and cover and simmer for another 15-20 minutes minimum. I put the vegetables into an ovensafe pan, added in the chicken and threw it into a 200 degree oven for an hour, but that's me. Serve the chicken mixture over the rice.